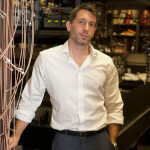 Associate Professor Michael J. Biercuk is a quantum physicist and technologist at the University of Sydney, and a Chief Investigator in the Australian Research Council Centre of Excellence for Engineered Quantum Systems (EQuS). His own group – the Quantum Control Laboratory – is discovering how to power a new generation of advanced technologies using the strangest rules of quantum physics. Michael will be joined by 14 other speakers on stage at the Sydney Opera House on Wednesday 25 May for TEDxSydney 2016. Share the experience by watching the live stream at tedxsydney.com/live or join one of hundreds of live satellites events around the country.